Mazda Certified, CARFAX 1-Owner, LOW MILES - 32,927! EPA 28 MPG Hwy/22 MPG City! Heated Leather Seats, Third Row Seat, Back-Up Camera, iPod/MP3 Input, Onboard Communications System, Turbo Charged Engine, Aluminum Wheels CLICK NOW! Leather Seats, Third Row Seat, Power Liftgate, Rear Air, Heated Driver Seat, Back-Up Camera, Turbocharged, iPod/MP3 Input, Onboard Communications System, Aluminum Wheels, Keyless Start, Dual Zone A/C, Cross-Traffic Alert, Blind Spot Monitor, Heated Seats Rear Spoiler, MP3 Player, Keyless Entry, Privacy Glass, Remote Trunk Release. 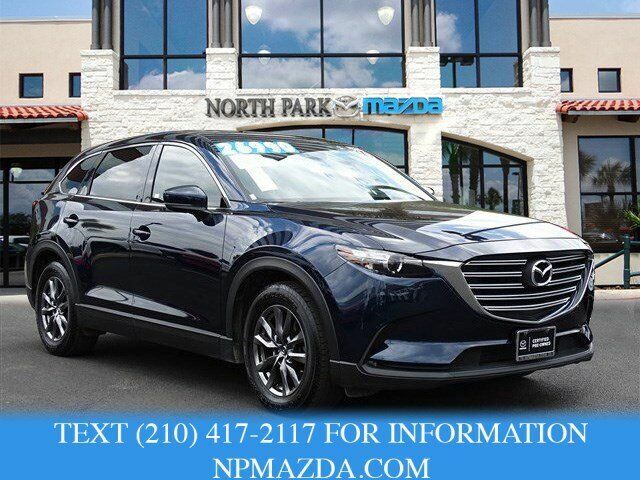 Mazda CX-9 Touring with DEEP CRYSTAL BLUE MC exterior and BLACK interior features a 4 Cylinder Engine with 227 HP at 5000 RPM*. KBB.com explains "The all-new Mazda CX-9 feels lighter, nimbler and even more athletic than its predecessor, while also boasting a quieter ride. Thankfully, the new CX-9's dynamic ways don't come at the cost of a stiff suspension. This one ably absorbs rough patches.". Great Gas Mileage: 28 MPG Hwy.